GROUND ZERO PLUS 1239 DAY--New York, NY, Wednesday, February 2, 2005--There's a grand national Mother of SuperBowl Vigilance that is unbeatable when it comes to guarding her flock of thick-necked, muscle-busting "boys." 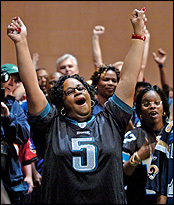 Her name is Wilma McNabb, Mother of Philadelphia Eagles' Donovan McNabb, 29-year-old starting quarterback for the Eagles. When he was drafted by the NFL Eagles team in 1999, fans booed and jeered him because they wanted running back Ricky Williams. 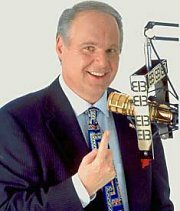 Conservative talk show radio host Rush Limbaugh attacked McNabb, inferring the only reason he was picked as starting quarterback was because he was African American and imputing his skill as great athlete. Radio talkshow host Rush Limbaugh has "eaten his words"
But the 6-foot, 2-inch, 240-pound McNabb had a secret weapon bolstering him through it all: his father and mother. McNabb's father, an electrical engineer, and his mother, Wilma, a nurse, instilled strong Principles of Vigilance in their son, enough to help him weather the storms of prejudice and bigotry, as well as inspiring him to achieve far beyond the grips of Terrorism's Fear, Intimidation and Complacency that shackle so many children and hobble their evolution as adults. In addition, McNabb also enjoyed Grandparents of Vigilance. 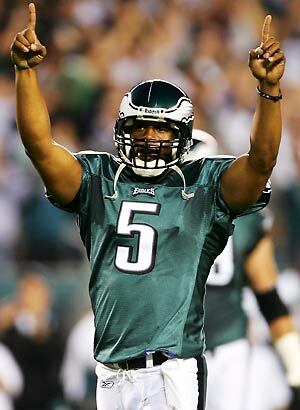 At every pre-game introduction and following each touchdown, Donovan McNabb taps his chest twice and points to the sky. He's offering a salute to his "greatest fans," his late grandmother and grandfather, Maude and Charles Jenkins. "I started doing it in my sophomore year in college at Syracuse and I've been doing it 4ever since," he says. "My grandparents were involved in everything I did. They were my great fans." His grandmother passed away of diabetes in McNabb's senior year in high school, and his grandfather died in his sophomore year of college. McNabb is the spokesman for the American Diabetes Association and operates a private foundation that his mother, Wilma, heads: the Donovan McNabb Foundation. While Donovan Jamal McNabb enjoys the largest contract ever awarded in the history of professional football, a 12-year $115 million package that puts him in economic history, he's now focused on chalking up a SuperBowl XXXIX victory in San Diego this coming Sunday. Only one other black quarterback, Doug Williams of the 1987 Washington Redskins has won the big game. But all his accolades and achievements are guarded by his primary Sentinel of Maternal Vigilance, his mother, Wilma. She's been thrust into national view as the spokeswoman for Campbell's Chunky Soup. Anyone flicking the television channels around is bound to see her beaming face in the locker room or riding on the Eagles' team bus, reminding the players about "eating right," and, of course, that includes Campbell's. She's also become a media star in her own right, appearing on major television shows as a guest and a symbol of a concerned mother. "Our goal was to raise two responsible sons," she said, boasting about her 32-year marriage that produced a football superstar and top mortgage broker in New Jersey. "We sent both boys to Catholic school to insure they got discipline both at home and at school," she added. Her fame as "Campbell Soup Mother" didn't come by accident. Originally, the commercials were shot with an actress. After watching them for a year, Wilma McNabb spoke up and said, "I can do that." Campbell executives gave her a try. In the world of high-paid professional sports, the image of the players has been ravaged by accusations of their "immoral" conduct, including sexual assaults to drugs and illegal betting. Wilma McNabb is a refreshing reminder that the vast majority of athletes come from strong, solid, supportive homes with fundamental values and great belief in the quality of human nature. More importantly, athletes have always been the role models for young people. Looking up at the top players in sports has been, for some youth, their single source of idolatry. Wilma McNabb puts some grounding into the idea that a top professional athlete can make up his or her own moral guidelines and live a life of abandon, free from the responsibility of mundane life. Her son's tribute to his grandparents before and during each game symbolizes the idea that a great athlete owes his or her enthusiasm and dedication to a group of loving, caring people who root for and stand behind them as they move up the challenging ladder of competition. 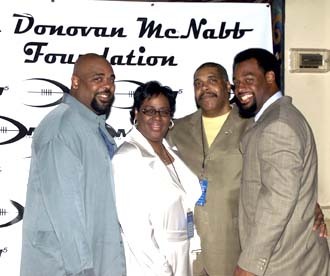 The relationship between Donovan McNabb and his mother on camera, plus the idea of a"family team" where Mrs. McNabb is the "team mother" provides another rich layer of earthiness to becoming champions. "It's all about being a team," she said. "Mothers, fathers, children, grandparents, loved ones, brothers, relatives...all rooting and working together...that's what it's all about." And that's what Vigilance is all about. 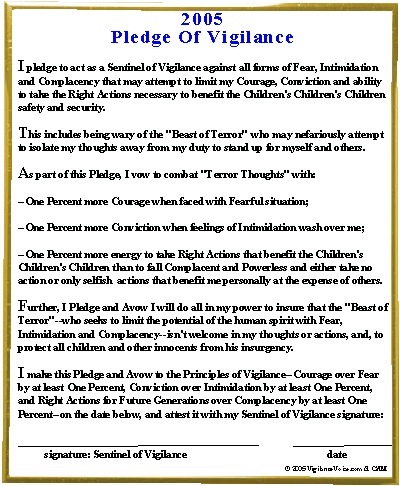 It's about the unification of people as family, working toward the proliferation of sound values such as Courage that trumps Fear, Conviction that overshadows Intimidation, and Right Actions that benefit future generations versus Complacency that suggests a child "can't do what others have done." 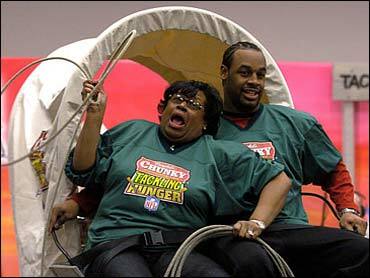 No matter what happens in the SuperBowl, Donovan McNabb and his mother, Wilma, and the entire team will be National Champions. Millions of young men and women, boys and girls, who aspire to achieve wonderful things in life will see a mother and her son and a team working together in one of the most watched sports events in the world. They will be a "Family of Vigilance" playing ball on Super Sunday. Perhaps the message of being a Family of Vigilance will rub off on their parents and bind their family closer. 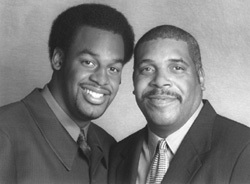 And even if it doesn't for some reason, the child will know that in relation to Donovan McNabb, his success is not singular. Everyone will know that behind every superstar is a Mother of Vigilance holding a can of Campbell Chunky Soup.